Am I the only one who instantly recognizes that there are 5% missing? 5% remain undecided on the douchebagality of the candidates. Well Iron-man does have degrees in Assholery,douchbaggery fascism. Channel 7 must be an affiliate of Fox News. TopHat: I think that this is a panel from the Marvel Civil War story line. 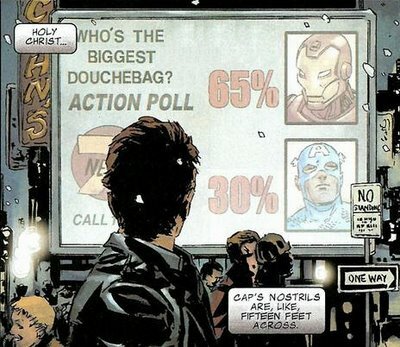 a guy sees a giant screen about whos more of a douchebag and all he can think about is the size of someones nostrils? May the size of the nostrils shows the level of awesome in a superhero.